Move-in ready homes with special incentives now available. D.R. Horton’s Southwest Florida Division is proud to announce the beautiful new amenity center at Sorrento is now open. 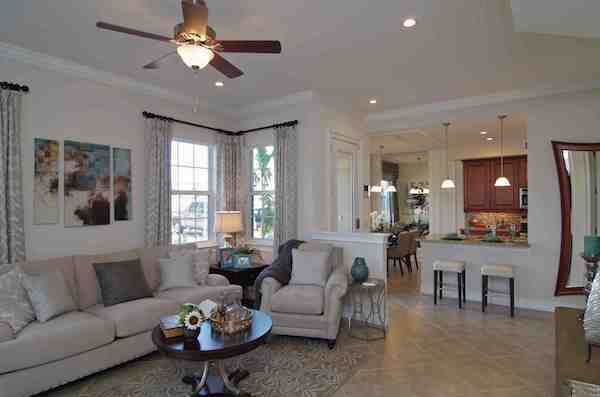 Additionally, the home builder announced move-in ready homes with special incentives available. Located in Bonita Springs, these spacious carriage homes start in the low $200s and offer elegant open floor plans, fine finishes, and large windows to capitalize on the tropical setting and plenty of natural light. At approximately 1,402 square feet of living space, the Capri plan offers two bedrooms, two baths, and a den, while the Ravello plan features three bedrooms, two baths, and a den at approximately 1,661 square feet. Amenities include a nicely appointed clubhouse, fitness center, and a resort-style pool. Each home is an end unit with only four homes per building. This pristine community is ideal for those who value an active lifestyle and enjoy convenient access to all that scenic Southwest Florida has to offer. Located off Bonita Beach Road at 28063 Sosta Lane, the community of Sorrento is two miles east of I-75, off Bonita Beach Road. Still, the location is a world away from the traffic and hustle and bustle of those sought after corridors and is surrounded by other luxury communities. Located directly between North Naples and Estero, all the shopping, dining, and entertainment options at the Mercato, Vanderbilt Beach area, Gulf Coast Town Center, Miromar Outlets, and Coconut Point are within easy access. In addition, Sorrento is only seven miles from Lely Barefoot and Bonita Beach. The Sorrento sales office is open from 10 a.m. to 6 p.m. Monday through Thursday, 1 to 6 p.m. on Friday, and 11 a.m. to 6 p.m. on Sundays. For more information, visit drhorton.com/swfl.